Ubuntu 11.10 (Alias : Oneiric Ocelot) released last week, If you are using an older version of Ubuntu or not using it at all (I mean you have never used Ubuntu or any Linux based OS, possibly you are a mac or Window user), then probably you are missing a lot of Fun and Joy! Better upgrade your existing version of Ubuntu to 11.10 or install Ubuntu 11.10 on a new partition (hey! non-Ubuntu user, just give it a try, you will love it; don’t think too much – it isn’t going to hurt anyway, as you can install it as Dual Boot without altering your existing operating system or even you can give it a try using Live CD or USB without installing it on your hard disk). 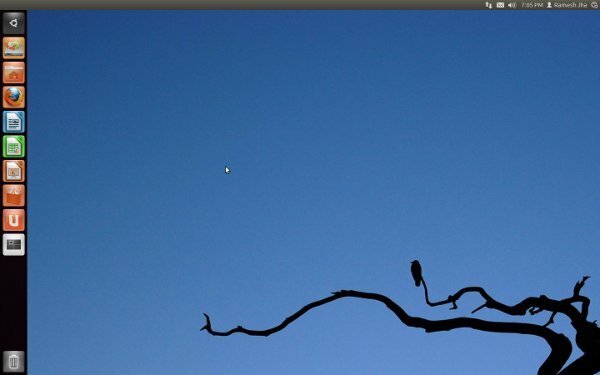 After a fresh installation of Ubuntu 11.10 you might be looking for some cool tips, tricks, hacks or customization tips so that you can enjoy Ubuntu in your own way. 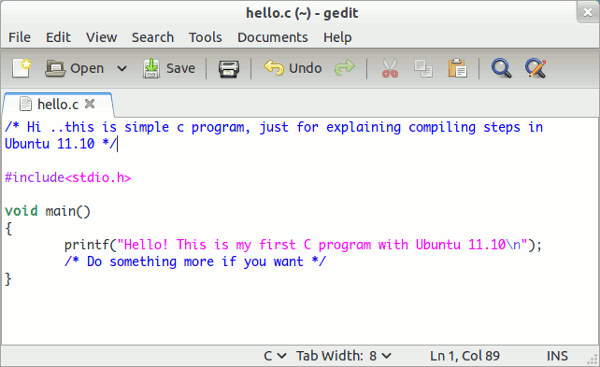 That’s a good thing and of course, this post will help you a lot, in customizing Ubuntu 11.10. 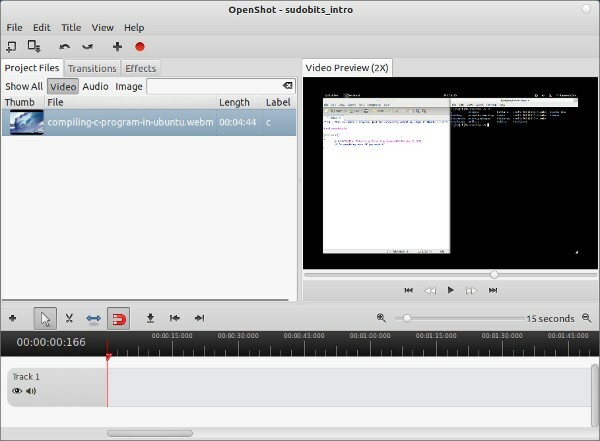 If you are new to Ubuntu, then you might have noticed that a lot of basic applications, codecs and plugins are missing (for example mp3 decoders – it means you can’t play mp3 files without it). Most of those programs/softwares are proprietary, that’s the reason why they aren’t included with default installation (Although from 11.04, there’s an option to install those package during installation) – to avoid copyright problems. Another obvious reason is, in order to make the size of installation file (ISO archive) as minimum as possible. I’ve already written a post about the programs/downloads that is mandatory after a fresh installation of Ubuntu 11.10, so I’m not going to repeat that here, Just follow the link : things to do after installing Ubuntu 11.10 and come back when you’re done! 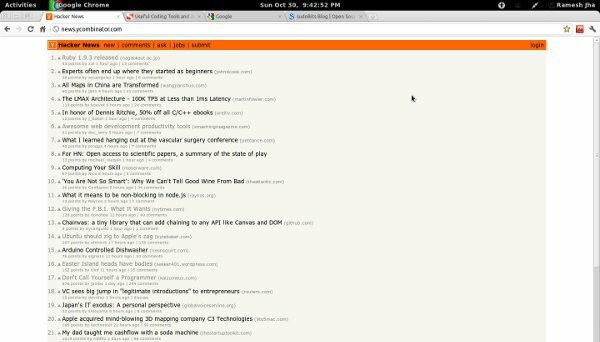 Here are some cool and best open source applications that you must try on Ubuntu 11.10. It’s not necessary that the collection of best Apps will be in a harmony with your favorite ones but it’s worth trying as it is based on my few years of experience with Ubuntu and community ratings/reviews over the web. Anyway, if you have some cool apps to share then do share it through comment. 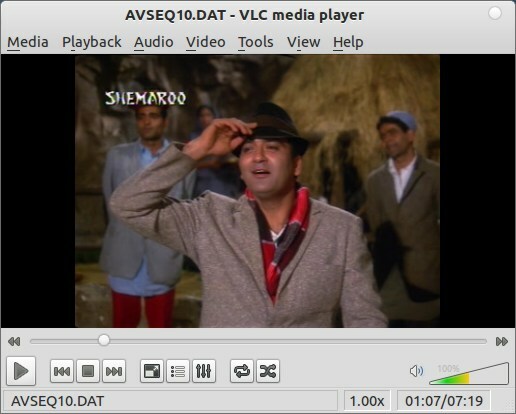 Audacious is a simple and easy to use audio player with a lot of cool features. The look is very similar to Windows’s Winamp player specially when you will choose the appropriate theme in preferences option. You may try other music players such as Clementine or Amarok (for more sophisticated features) but Audacious works great and It just works! or read more about installing google chrome in Ubuntu 11.10. FTP(File Transfer Protocol) client is a simple GUI application that will allow you to upload/download or manage remote files, typically hosted on your shared or Private(VPS/Dedicated) web server. 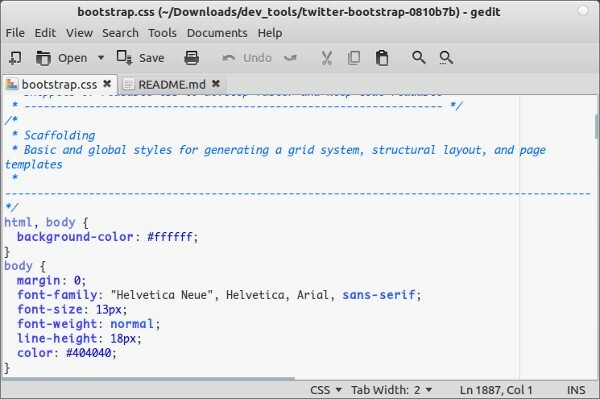 It is a must have application for web developers because it is very useful in editing remote files in real time, in nice and easy to use interface, with your favorite code editor such as gedit. FileZilla is cross-platform application. It also supports file transfer in secure(encrypted) mode i.e SFTP. That was just one example, a number of free plugins are available to customize it as you want. 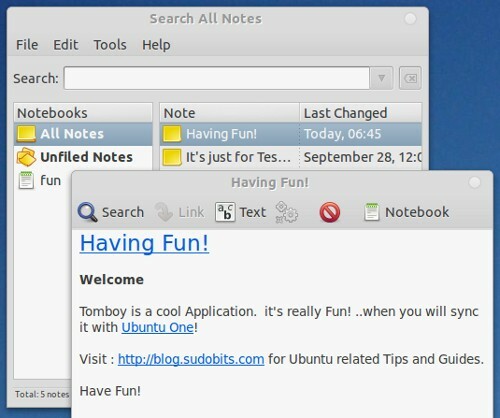 Tomboy Notes is one of the coolest default application, included with Ubuntu 11.10 (may be it will also be available in the upcoming version – 12.04). If you have ever used Evernote or other similar application (such as Nevernote – an open source clone of Evernote) then you need no explanation about what really it is. As the name suggest – it’s a simple application that will allow you to take small notes, you do not need to hit save button or Ctrl+S, just write it on a note and you’re done. It will even synchronize it with the Ubuntu One cloud (or other local or remote location of your choice). I use it daily – for writing new post ideas or tips for this blog. 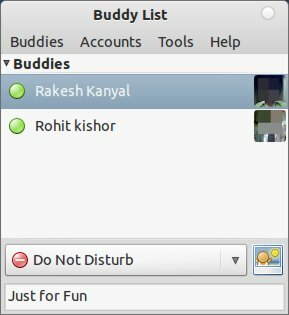 That’s all, now you can add an account to starting chatting with your buddies. 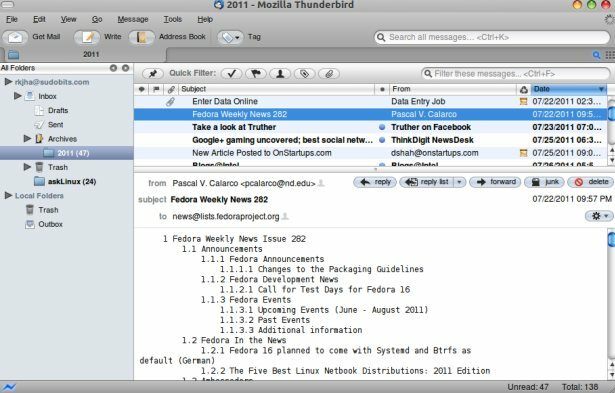 Thunderbird is the most popular open source and cross-platform application for sending and receiving email right from your Desktop i.e it’s an Email client. You enter your email provider details and send/receive emails in one click. A lot of plugins are also available to extend the core functionality (according to your need). It is already installed in the latest version of Ubuntu 11.10 (in other versions of Ubuntu or other Linux distro search in Software Center or synaptic package manager). 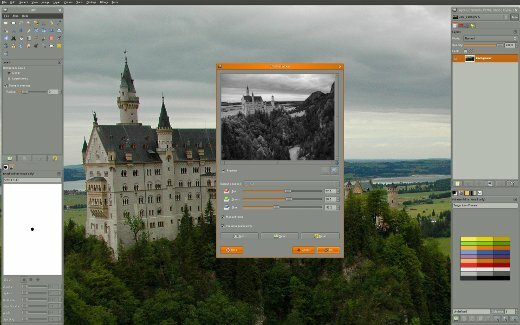 Ubuntu (The latest stable version : 11.10(Oneiric Ocelot), released few weeks ago) is one of the most Linux based popular operating system and gradually becoming more popular among programmers and web developers. C/C++/Java programmers and web developers are rocking with the Ubuntu as it has a bunch of open source development tools available to increase the productivity at minimum or zero cost. Ruby on Rails is one of the most popular framework for developing web applications using Agile approach. Rails (Latest version : 3.1) is based MVC (Model View Framework). 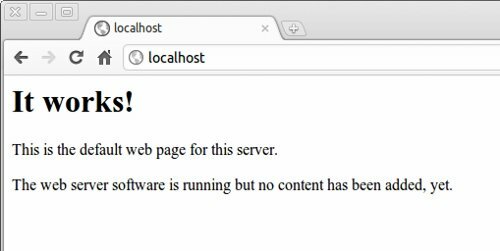 Getting started with Rails has been little messy (On Linux platform) for beginners due to its installation/setup errors, probably due to some missing dependencies (e.g gems).Relax, it’s very simple, you just need to understand few basic things. 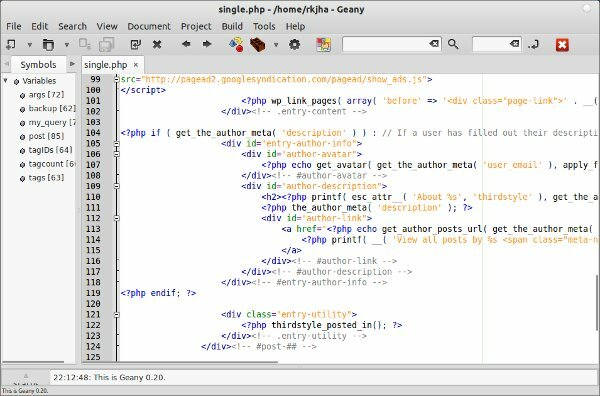 This post has been written for those who want to get started with ‘Ruby On Rails'(commonly called as ROR) on Ubuntu 11.10 or the rails developers who want to develop cool application with Ubuntu 11.10. To install ruby on rails in Ubuntu 11.10 (or other similar Linux distribution such as Linux Mint, Debian etc), just follow these simple steps. Although RVM is not strictly necessary but it’s strongly recommended – it will allow you to use multiple versions of Ruby, which may be be required in some cases. Now, it’s time to install the ruby version you want (you’re recommended to use either 1.8.7 or 1.9.2). The generic syntax is rvm use version_name. It will also install the associated packages such as RubyGems and Bundler. Now, create a sample application (just for testing) using Ruby on Rails. Update 1. Fixed some typo in commands! and adds a link in resources! Update 2. My Rails Application : Railyo – a private job board for rails developers/freelancers. Ubuntu 11.10 final version is out now. You can either install the Ubuntu 11.10 (oneiric ocelot) on a separate partition without affecting the current version 11.04 (Natty Narwhal) / 10.10 (Maverick Meerkat) / whatever version you’re using right now, or just upgrade the current one to its latest stable version i.e Ubuntu 11.10. If you’re using Ubuntu 10.04 LTS (Long Term Support) on a production machine (for example as a VPS server), then it may not be necessary to use the latest version (and there may be some unknown critical bugs), so upgrade is not required (in fact it’s not recommended unless you know what you’re doing). On the other hand if you’re a desktop user then you may want to try some new and exciting features of Ubuntu 11.10 – specially Gnome Shell, for Next Generation Desktop Experience. When you’ve created a backup copy for your important data (it will save you from any failure, so don’t forget to create a backup first), you can start upgrade process. You must be connected to internet because during upgrade process a lot of packages will be fetched from Internet. Open terminal (press Ctrl+Alt+t) and execute the following command(s) to start the update manager (you can also start Update Manager from Apps list). Then click on Check Button to check for updates, it may take few minutes to fetch the latest details about the distribution/packages. 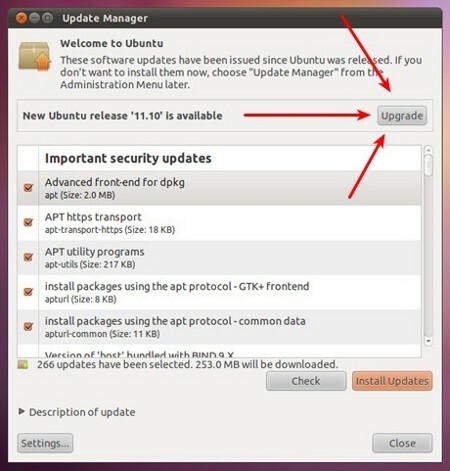 In update manager window, you will get a notice like ‘New Ubuntu release ‘11.10’ is available‘. Click on Upgrade (button near that), then again confirm it in a new window and wait for the upgrade process to complete. Now, restart the system and enjoy the new version of Ubuntu!